I was craving cake yesterday. Seriously craving it. Cake and maple bars are my favorite indulgences and I couldn't think of the last time I had either. Okay I could actually, but it has been a couple weeks and the maple bar wasn't that good. My kids were big helpers and couldn't wait to eat cake after supper. My daughter fell asleep on the kitchen floor 5 minutes before supper and my son wanted his cake with no frosting so I left out a chunk for him before I frosted this. Plus, we had the most tender juicy amazing beef tenderloins, but seriously they were so good I had to fight my son and my husband for the last bite, so no pictures of that. We also had some rabbit food (salad) and some rice, but compared to steak and cake, not hardly worth mentioning. 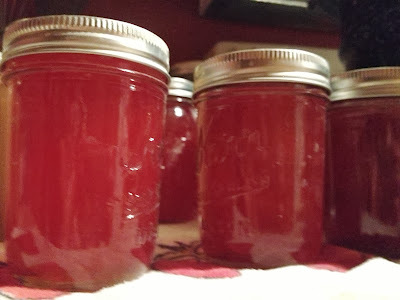 My kitchen was one big mess most of the weekend, but I did get almost 2 gallons of applesauce canned and 7 pints of crab apple jelly made. I also froze 4 pints of beets and today will freeze some carrots all from my garden. My kids think they are abused because I never buy jam or jelly at the store. I always make it instead. 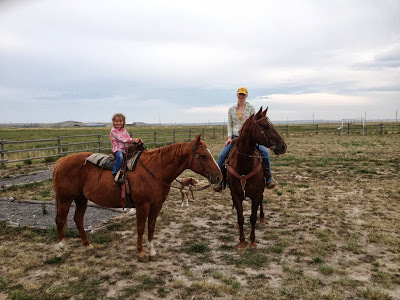 Avery and I went for a ride yesterday too. I am not sure what Cola, Shorty, Pepsi thought was so interesting, but clearly they couldn't be bothered to look at the camera. I love the smile on my daughter's face. She is excited about getting to help work cows this fall. 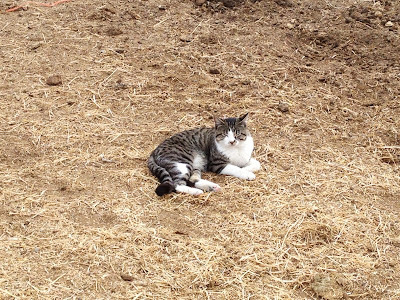 Cade also put Shorty through his paces in the corral. 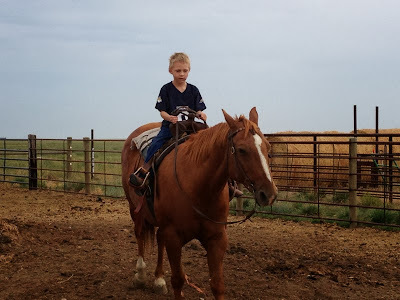 He is really gaining a lot of confidence with his riding this summer. 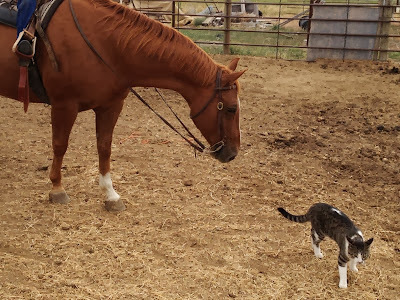 until Shorty came over to say hello and Rocky apparently didn't like horse breath in his face. If you are like me, you are still thinking about the cake at the top of this post. Currently I am trying to talk myself out of eating it for breakfast. not a lot of running but since I ran Tues, Wed, and Thurs and will today I wanted to get in some cross training. Two weeks until Ragnar Colorado!!! Yep, I'm definitely still thinking about the cake. That looks amazing. I also kind of want to make jam now, too. 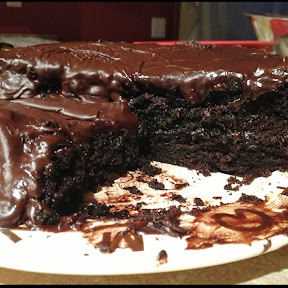 That cake looks sooooo moist and chocolate-y - YUM!! You've been busy and in a good way! That cake looks amazing. Love your pics and wish I could snitch some of your crabapple jelly! Used to make it all the time too and so in love with the color! That cake looks amazing- but a good steak sounds awesome right about now. My husband turned 50 last week and we have been celebrating with German chocolate cake since! It's one of the best ones I've ever made. I'll trade your kids store bought jam for some of that homemade stuff! They don't know what they're missing. That cake looks delicious and would make the best breakfast, remember you'll need lots of energy for Ragnar...! Canning is such a mess while in the process. I am making salsa at this exact moment and my kitchen is just a mess. I still have to make spaghetti sauce too later tonight. I need a couple hour break first. That cake looks amazing!!!!! We have been cooking a lot of steak lately too. It just tastes so good when it is off of the BBQ. Someday I want to learn how to can. I would love to make my own jam and pickles! i did not need to see this post before bed, now all i can think of is cake!!! How do you prepare your carrots for freezing? My mom always canned them, and I HATE mushy carrots!! Id love to be able to plant carrots for the winter!! And that cake looks amazing!! !